Oh 2016, what a crazy year you’ve been! I feel like so much has happened this year. From new countries to a new job, a new apartment to a newly designed website, there has been a lot of “new” this year. The one constant, however, has always been travel. This year, I came up with a new goal: to visit 35 countries by the time I’m 35 years old. I managed to get closer to achieving that goal by traveling to Costa Rica, Jamaica, and Canada this year. That means I have a year and a half to visit 6 more countries. I’ve also managed to travel around the US more. I visited new cities like Irvine in California, Frederick in Maryland, and Seattle in Washington but I’ve also gone back to old favorites like Denver in Colorado. Of course, exploring more of my home state of Florida is always high on my priority list so I managed to squeeze in things like a segway tour in Tallahassee and a food tour in West Palm Beach. But even though I was managing fairly well to travel despite my 9-5 job, I still wanted more. So I quit. Yup. I left my safe government job and got another job with a private company that would allow me to work from home most days of the week. This gave me more of the flexibility I wanted to be able to travel more. People often ask how it is that I can travel so much when I work full time and I always tell them it’s about priorities. The only down side to this new job was it’s location. The office where I would have to go a couple of times a week was a lot further north so I was going to have to move. My old apartment was four blocks from the beach. 4 blocks!! So although I do love my new apartment, I do miss being able to walk to the beach and lay out on the sand. 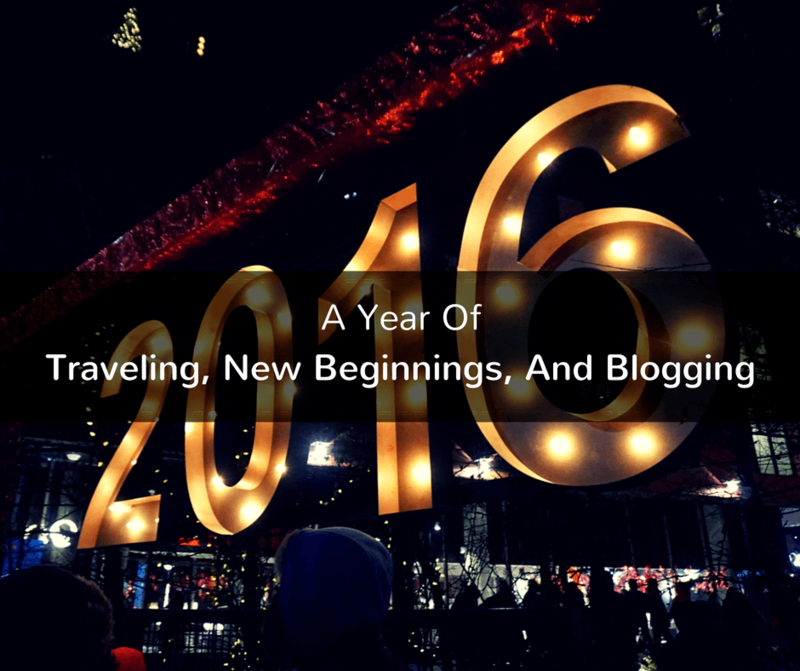 This year I think I really found my groove when it comes to the blog. I’ve been pretty consistent with the amount of blog posts I write per week, my social media accounts continue to grow, and I’ve worked with more tourism boards than ever. I think it’s because I keep pushing myself to think of the blog as more of a business, not just a hobby. I also decided to professionalize my blog a bit and had some changes made. My favorite new features are the maps; you can click on them to see all posts related to that country or state. I’ve also been fortunate enough to be able to meet up with other amazing bloggers this year, which is always so much fun! Hanging out with Lindsay of I’ve Been Bit at the Toronto Christmas Market. At the end of last year, I had no idea what 2016 would bring. I was going to wing it. I feel a little differently this year. I already have my first big trip scheduled for February to Iceland and Denmark (eek!!) and I’ve got some projects lined up with companies that I’m very excited about. I also feel a lot more confident now about reaching out to tourism boards, so I’m going to keep pitching to them and start pitching to magazines and other print sources. What about you? How was your 2016? Any plans for 2017? We’d love to read your comments below! This is truly enlightening and inspiring at the same time! I’m so excited to read about your future Iceland tour and indeed you had a great year. Cheers to 2016! Awesome! I am so happy for you. That has been my goal for about 5 years now, to go to as many countries as I am years old. I will finally get caught up in 2017! woohoo. Wishing you a wonderful year 2017 with continued success. Your almost there, 6 countries in a year in a half is definitely doable! My life goal is to make it to all 50 states and continents by the time I’m 50 that only gives me 5 years, yikes! I’ve been to 35 states so far, but with moving to the UK, my us dreams seem to be dwindling because I’d rather spend my time traveling to visit family. I went to see my parents 6 times last year, will have to remedy that in the coming years. Good luck with you goals, it sounds like you have had a fantastic year! I love reading these year-end roundup posts of other bloggers to see how their year has been and what their goals are. You sound as if you’re totally on the right track, so congratulations for a successful year. We’re hoping to visit Denmark this summer. So far the only trips booked is a cruise in Feb to Greece, Malta and Cyprus. Oh, that cruise sounds great! Those are three places I’d love to visit as well! Congrats on a successful year with more success in the horizon. Your February trip sounds like fun and hopefully two more countries to add to your list. 6 more is absolutely doable in another 6 months! Go for it! Girl, you make me feel so disorganized! Congrats on a great year and hopefully 2017 is even better. Happy New Year! Look at that Jamaican sunset! Hoping all the best for you and your blog during 2017. Looking forward to reading more about your travels.